START UP Season 3 Teaser! If you haven’t heard, Air Temple is a featured business on PBS’s START UP which will begin airing this fall! Our schedule for Spring Session 2015 is live! Registration opens 3/04/15. Please read up on our studio and registration policies before signing up for class. Here’s the schedule. Some instructors are available for private lessons. Special Relativity – Circus through Space and Time from Stacey on Vimeo. Special Relativity is a full-length, contemporary circus show of original material conceptualized by Stacey Kigner and Allison McDermott, and created in partnership with Air Temple Arts. It will debut in New Haven, Connecticut in January 2015, with plans to adapt it for touring. In Special Relativity a steel magnate from the 1890s finds both his mettle and the depth of his devotion tested when a space/time accident separates him from his consort. If he’s going to have any chance of seeing her again he has no choice but to follow her path through the time vortex. We’ll travel from the Stone Age to a dystopian future, telling the story of Special Relativitythrough Chinese pole, aerial dance, acrobatics, contortion, Spanish web and more. Special Relativity will play at the ACES ECA theater on January 16th and 17th, 2015. We’re currently raising funds for Special Relativity with an IndieGOGO campaign. Learn more about the show and contribute here. Workshops with the 7 Fingers! Air Temple Arts is thrilled to be hosting workshops taught by the amazing Montreal circus troupe 7 Fingers! Workshops in the following disciplines will be taught: Diabolo, Chinese Pole, Hand to Hand, and Aerial Straps. Workshop material will be dictated by the interests and abilities of the students in class. All workshops are $60 per person. To register visit: https://clients.mindbodyonline.com/ASP/home.asp?studioid=96983 select ‘session classes’ and then ‘workshops’ from the drop down tab. Email info@airtemple.com with any questions. Hou Kai was born in 1993 in Henan Province of China. Hou Kai started his strict training at the age of five at the Shaolin Temple in Henan. This training gave him a strong foundation to become an amazing acrobat in the following years. At the age of eight Hou Kai joined the China Acrobatic Troupe where he went through extensive training. Within nine years he acquired various acrobatic skills such as hoop diving, Chinese diabolo, tumbling, juggling balls, juggling hat, Chinese pole, dancing, and martial arts. 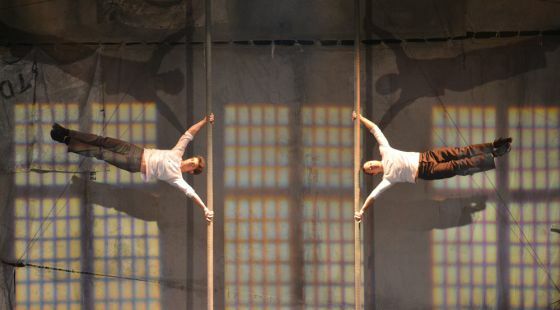 Hou Kai’s acrobatic skills have been seen and admired at the Tian Di Theatre for the past nine years. He performed daily with the acrobatic troupe and also had his own Chinese diabolo act. Hou Kai left the China Acrobatic Troup in 2010 to pursue his career as a performer. Apart from China, he also performed in the USA, Greece, Turkey, Italy, Switzerland, Czech, Germany, Japan, Australia, Hungary and Hong Kong. Leaving the stage with loud applause by his breathtaking acts gave him a lot of confidence when performing. Through this experience he can call himself a professional acrobat performer. This pole workshop is for experienced students who are comfortable moving and working on the Chinese pole. Proper shoes and attire required. With roots in classical dance Jazz and Hip Hop Fletcher started his circus formation at the San Francisco Circus Centre, From there he continued his formation at L’Ecole nationale De Cirque De Montréal and completed their 3 year program. A generalist at heart he loves to try everything but specializes in Chinese Pole, Trampoline Wall, and Teeterboard. He has performed with many companies including: San Francisco Youth Circus, Vau de Vire society, Haut Vol productions, Cirque Productions, Cirque du Soleil, and the 7 Fingers (AMUSE). He was performing for 2 years with Cirque Éloize in their new creation “ID” and works closely with the Catwall Acrobats as one of their main acrobats. This workshop will focus on hand to hand and related skills dictated by the interests and levels of the students in the class. Advanced students only, existing partnerships preferred. This straps workshop is a mixed levels class and is appropriate for beginners and advanced straps artists. The class will be taught to the level of students in attendance. Students do not necessarily need previous straps experience but should have at least a solid aerial foundation. London-boy LJ (Kalyn) fell in love with the circus arts at the age of 18 after taking part in a youth project with the Bassline Circus. 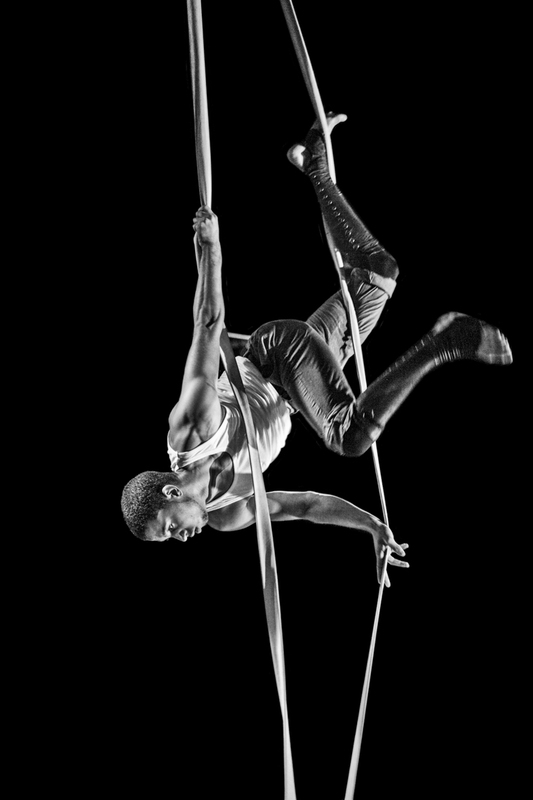 A self taught street and hiphop dancer, he spent the next three years at the Circus Space, specializing in aerial straps. After developing his skills and approach, he performed in projects such as Finland’s Turku Festival, France’s Circa Festival, and an out- door series with the British National Theatre. LJ joined TRACES in 2012. Founded in Montreal in 2002, the 7 Fingers initial goal was to bring circus to a human scale. They began as artists on stage, creating collectively, and soon branched out, expanding their creative talents as directors, choreographers, writers and coaches, passing on their collaborative and unique 7 Fingers process to a new generation of circus artists. Join us for Air Temple’s spring Open Stage Night! The Open Stage will take place on May 2nd, 2014. This Open Stage will feature the following skills: aerial silks, hula hooping, burlesque, aerial hoop, and tribal/belly dance. Spring Open Stage Night — Call for performers! We will not be accepting musical performance acts. We will also be limiting the number of each kind of act to prevent redundancy–for example no more than three roller skaters etc. If you have an act, but you’re not sure it falls into any of the above categories, submit it! You may submit a new work, or an act you’ve performed before, but not an act from a previous Air Temple Open Stage Night. 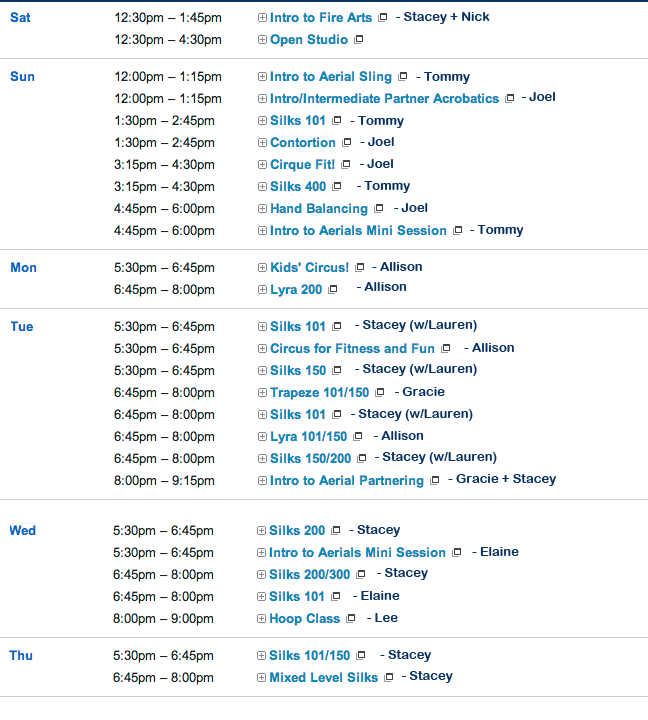 REGISTER ONLINE FOR CLASSES HERE! Welcome to Air Temple Arts! 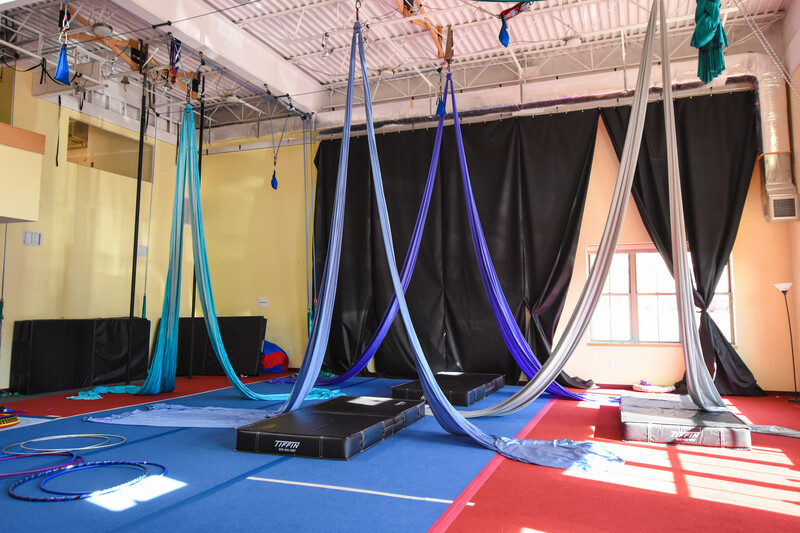 We’re an aerial dance and circus studio located near downtown New Haven, with a Satellite Space in East Hampton. 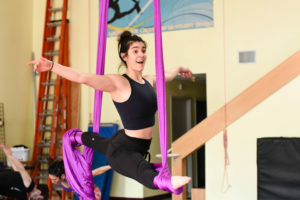 Air Temple is the premiere circus facility in Connecticut, and the number one place to learn the popular aerial art forms of trapeze, aerial silks, and lyra (aerial hoop), as well as traditional circus arts such as contortion, tumbling, juggling, partner acrobatics, and hand balancing (handstands). 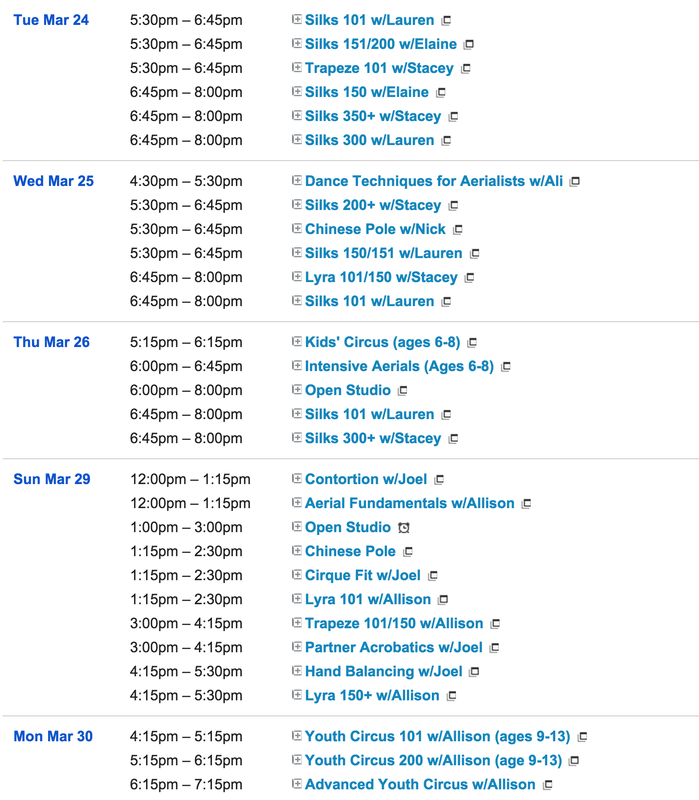 We feature a wide variety of weekly classes for students of all levels with a focus on safety and smart progressions. We also offer specialty workshops from traveling professionals, private and semi-private lessons, open studio times for students to practice, juggling jams, performances and more. 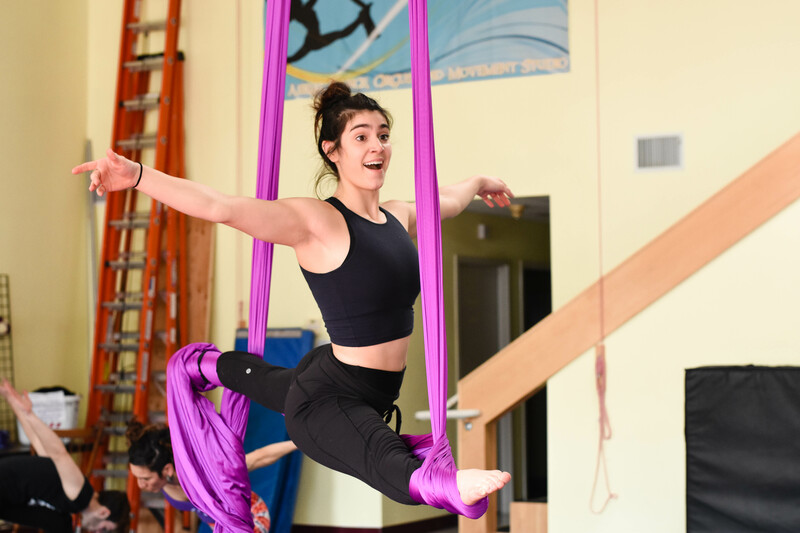 Our mission at Air Temple is to provide students of all ages and abilities with endless opportunities to explore the circus arts–whether for fitness, fun, or both–in a safe, encouraging atmosphere with the best instruction possible. We strive to help students foster strength and self-esteem, and unlock the ability to use their physicality to interact creatively with the world. We value the safety and well-being of our students above all else. Air Temple Arts is fully insured in all disciplines that we offer. The entirety of the workable studio space is covered in carpet bonded foam and crash mats are employed in all aerial instruction. For tumbling, partner acrobatics and dynamic aerial skills we have safety lines and a spotting belt at the ready. Our instructors are highly trained and our classes are small with a student-teacher ratio of 1:6 or better. Learn more about or safety practices and why you should choose Air Temple here. 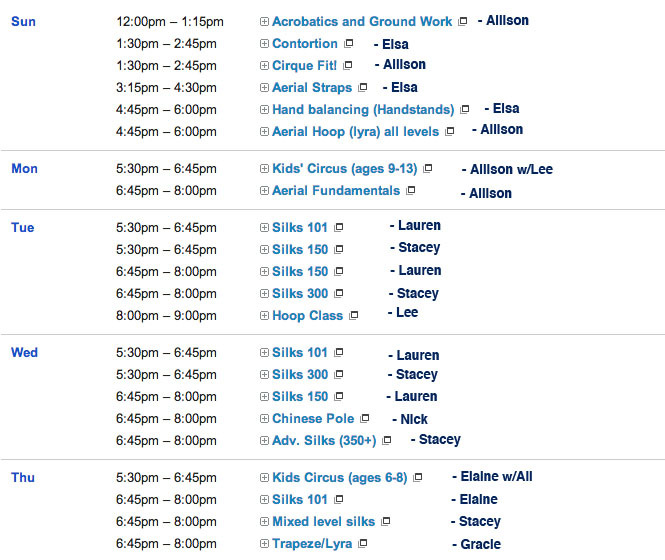 Curious about how classes work at Air Temple? Read our Class FAQs. 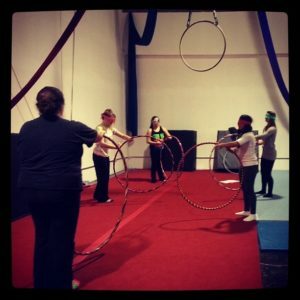 Looking for professional circus performers to add effortless grace and skill to you next event? Check out our Performance page. Want to register for classes? Head to our Registration page. Want to learn more about Air Temple’s coaches? Check out our Instructor Bios.